Full length native protein (purified) corresponding to Rabbit Sarcomeric Alpha Actinin. Purified rabbit skeletal α-actinin. WB: Mouse and rat skeletal muscle and rat heart tissue lysates. IHC-P: Human skeletal muscle tissue. Our Abpromise guarantee covers the use of ab9465 in the following tested applications. IHC-P 1/25 - 1/50. ABC method. We suggest an incubation period of 60 minutes at room temperature. However, depending upon the fixation conditions and the staining system employed, optimal incubation and dilutions should be determined by the user. WB Use a concentration of 1 µg/ml. Detects a band of approximately 103 kDa (predicted molecular weight: 103 kDa). Immunohistochemistry (Frozen sections) - Anti-Sarcomeric Alpha Actinin antibody [EA-53] (ab9465)Image from Boyer JG et al, PLoS One. 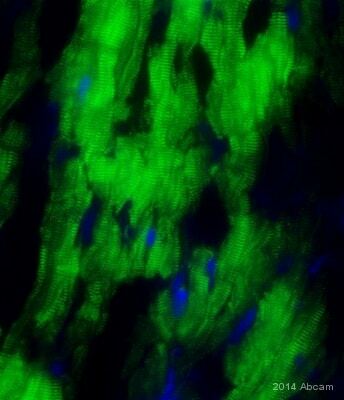 2010 Mar 1;5(3):e9465, Fig 4.
ab9465 staining Sarcomeric Alpha Actinin in mouse heart tissue by Immunohistochemistry (Frozen sections). 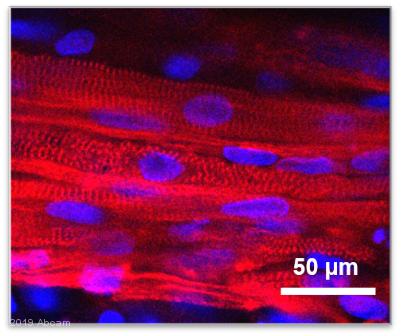 Serial longitudinal (12 µm) sections from wt hearts were incubated with ab9465. Nuclei were visualized with DAPI. Immunocytochemistry/ Immunofluorescence - Anti-Sarcomeric Alpha Actinin antibody [EA-53] (ab9465)Image from Burridge PW et al., PLoS One. 2011;6(4):e18293. Fig 5(B,C). ; doi: 10.1371/journal.pone.0018293. Immunocytochemistry/Immunofluorescence analysis of H9 hESC and CBiPSC6.2 cells labelling Sarcomeric Alpha Actinin (green) with ab9465 at a dilution of 1/200. 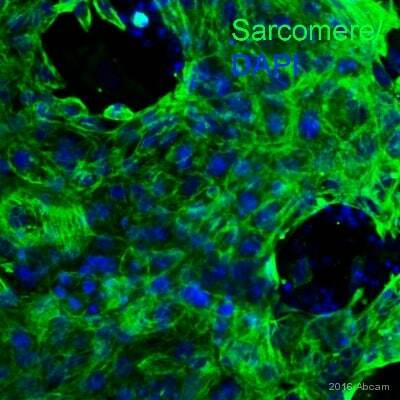 An Alexa Fluor® 488-conjugated goat anti-mouse IgG was used as the secondary antibody (1/200). Immunofluorescence - Anti-Sarcomeric Alpha Actinin antibody [EA-53] (ab9465)Imge from Biswas.H et al PLoS One. 2016 Oct 5;11(10):e0162636. doi: 10.1371/journal.pone.0162636. eCollection 2016. Immunofluorescence staining of SNAIL1 and cardiac cell type markers (alpha actinin-cardiomyocyte marker; 1/100 dilution) in the ventricular infarct zone of LAD surgery mice. Scale bars: 50 microns. 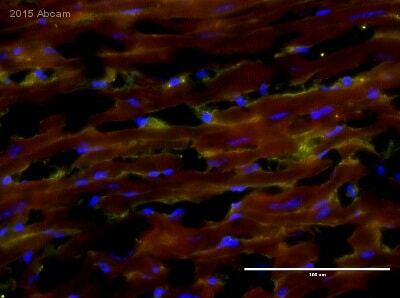 5 um sections of paraffin or OCT embedded hearts were utilized for Massons Trichrome Staining and immunofluorescence. For SNAIL1 immunofluorescence, antigen retrieval was done in Nuclear Decloaker solution and TSA plus kit was used to amplify SNAIL1 signal. Additional bands at: 25 kDa, 57 kDa. We are unsure as to the identity of these extra bands. Immunohistochemistry (Formalin/PFA-fixed paraffin-embedded sections) analysis of human skeletal muscle tissue staining Sarcomeric Alpha Actinin with ab9465. Publishing research using ab9465? Please let us know so that we can cite the reference in this datasheet. 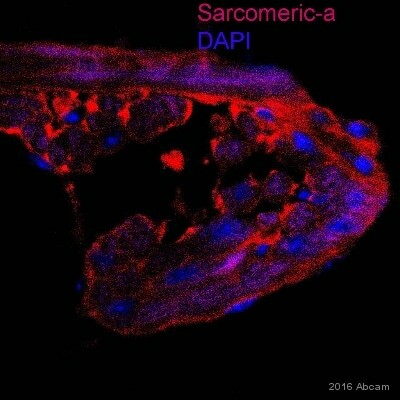 I refer to your Anti-Sarcomeric Alpha Actinin antibody [EA-53] antibody. together with Myosin (MF20 a general muscle marker monoclonal mouse). antibody was produced in the mouse as well. Thank you very much. I'm looking forward to hearing from you soon. ab127055 allows the use of mouse antibodies on mouse tissue to obtain excellent signal intensities and clean background. 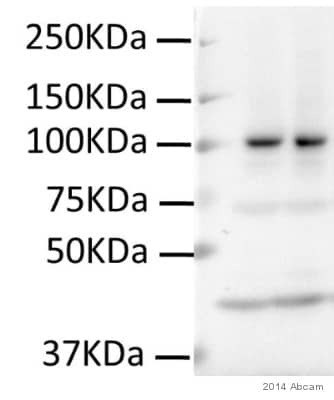 Another alternative i could recommend would be using three antibodies in total: Use a Fab-fragment anti-mouse antibody against the H+L chain to block the endogenous mouse IgGs, than incubate with your primaries and (as you suggested) use an isotype specific secondary antibody. A Fab fragment antibody has the advantage that it can "cover" the endogenous mouse IgG tighter than a whole IgG antibody. 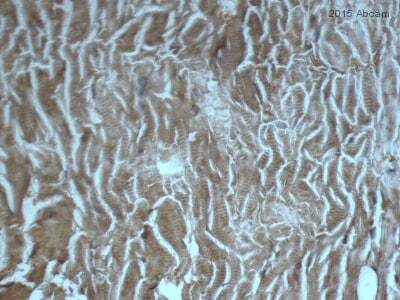 What percentage of sodium azide is in the buffer of this antibody? Thank you for your call yesterday and for your patience while I've looked into your enquiry. I've heard back from the lab, and there is 0.05% sodium azide in this antibody. I will update the datasheet and have an MSDS madepromptly. Please let me know if you have any further questions or if there is anything else that we can do for you, and I'll be happy to help.